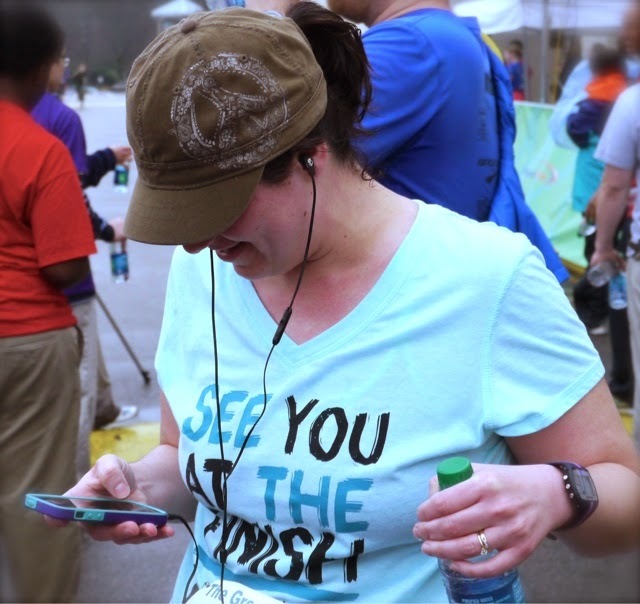 Life at Pemberley: It's 5k Season! I know, I know. I've got about four or more posts rattling around in my head that I'm SUPER behind on. For now though you'll have to deal with this one post. It's been a crazy season and I'm still playing catch up. 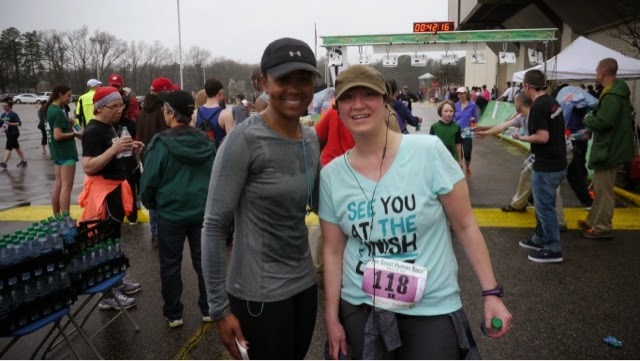 I of course had big plans to train every day, or more realistically in a pinch, every other day so I would feel completely in my element doing this 5k. This one today was really important to us and I wanted to do it well. It was important because we were running for our adoption agency. 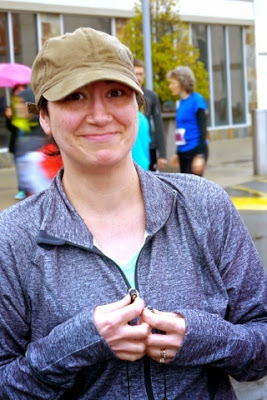 Well, CC is still relearning how to walk and stand and drive, so of course he couldn't do the 5k today, though he still came out to support me which was wonderful as always. 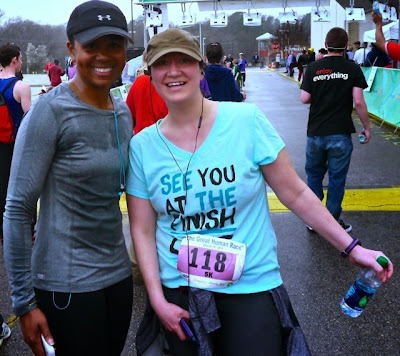 My training didn't go so well, mainly for all the other blog post reasons I haven't written yet, but I was at least hopeful to run a lot this past week in anticipation of the 5k. That didn't really happen either so I was pretty anxious going into today's run. Hubby as ever, saved the day by reminding me last night that this 'was just another workout' which I could easily handle. I get all wrapped up in the official time record and the masses of people and he boils it down each time for me to it being just another workout. Such a helper that one! Today has been super rainy and therefore wet. It's not as warm as it was supposed to be, but still a bit mild. 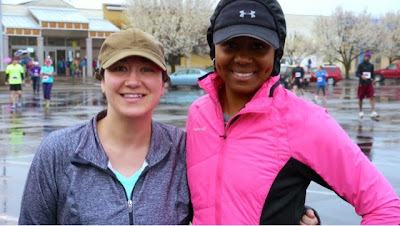 We kept praying that the rain would let up and not be monsoony during the actual run, AND IT WASN'T! How cool is that?! I never once saw anyone hurt or ill on the side of the course which was a first for me. Made it kind of nice to have so many volunteers and 'cheerers' on the course! I had two goals for today's race based on my previous not too great lack of training: one, to finish (obvious! ), and two, to try to beat 45 minutes. I always try to beat 45 minutes, but I'm short and slow when running, so it's a pretty lofty goal for me actually. I finished AND crossed the finish line at 41:30! Woohoo! I had a friend running in the same race for her first 5k and she finished about five minutes ahead of me. It was fantastic to be a part of her first 5k experience! Today was such a great reminder of why I love running so much- I hate the build-up to it, but I find running so addictive! I can't wait to find my next race to sign up for and I REALLY want to do a 10k and a half marathon in the next year. Wouldn't that be something for this reformed couch potato?! Below are the photos my friend took of today's run. I'm so thankful he got these for me- I love having each accomplishment documented! More of the before, waiting for the start! This is the after, trying to stop my iPhone apps now that I was FINISHED! Can you see how red my face was? It happens. The completed goal is so worth it!